iDISC has several international offices that have made great strides over the past few years. This is perhaps most evident in the case of iDISC Mexico, which now has a production office in Xalapa, and a coordination and management office in Mexico City. On June 24th, the Xalapa team moved to a larger office near its previous location in order to hire more employees and increase production capacity while continuing to focus on producing high-quality work. On the day of the move, the team continued to work seamlessly thanks to the support of the Mexico City office and the proximity of the old and new locations. 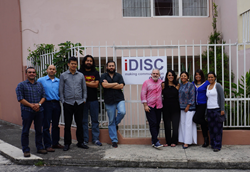 In addition to the Mexican office, other iDISC teams in the Americas, such as the team in Brazil, are also expanding. On top of translation services, iDISC also develops website platforms and mobile device applications, so that clients can distribute any content they desire, in any language, on any device. iDISC was founded in 1987 and aims to help businesses and organizations publish and distribute content in any language on any device. To accomplish this goal, iDISC provides publication platforms for a variety of devices and channels, as well as custom development, content editing, and translation services. The business is composed of a team of professionals who undergo a continuous training and improvement process, and who are always ready to offer clients high-quality service. With almost 30 years of experience in the sector, iDISC Information Technologies has been endorsed by more than 300 satisfied clients, and is pleased to be able to offer its clients outstanding service.